Kerry TD Michael Healy Rae may believe that avoiding eating meat to help the world’s climate is “crazy” and “a fad”, but whatever your view on that particular issue, there’s no avoiding the fact that the Irish consumer’s relationship with food is changing. The challenge for farmers and other food producers is assessing whether a particular food trend is indeed just a fad, or whether it indicates a change that is likely to accelerate. So what are the issues likely to impact Ireland’s food scene in 2019 and beyond, and how are they likely to impact farmers? As the marketing campaign for Veganuary draws to a close, it’s hard to ignore what seems like a move towards more plant-based eating. But just how pronounced a trend is this: is it just marketing guff or is there substance behind it? The Bord Bia Dietary Lifestyle study published in late autumn last year surveyed 9,000 people across five markets and found that consumers are in fact making efforts to reduce meat intake, with an interesting move also taking place to towards purchasing higher-quality, higher-cost meat. A lesser number of consumers are aiming to reduce dairy. However the value of sales of milk alternatives (soya, nut etc.) has risen by 19pc since 2012 in Ireland, according to Euromonitor. Meanwhile, figures from Mintel Research show that ‘dairy-free’ and ‘vegan’ are the second- and third-fastest growing on-pack claim for new food and drink launches globally in the last five years. “Our Dietary Lifestyle study also found that around 4.1pc of the population in Ireland are dietary vegans, equating to approximately 146,426 adults, while 4.3pc are vegetarians, which represents 153,569 adults,” said Grace Binchy, consumer insights specialist with Bord Bia. Bord Bia’s income from a statutory levy on slaughtered or exported livestock increased to €5.9m in 2017. For farmers, this means that it’s time to recognise that consumers have a desire for food that comes in a more natural state. There is also a need to communicate the inherent health credentials of food, be it vegetable- or animal-based. While there are some trends in foods that have been going for some time and show no sign of stopping – consumers still want foods that are lower in fat, salt and sugar – there are some trends that can be specifically linked to the buying interests of younger people. In particular, foods associated with the paleo and keto diets – both of which emphasise eating more protein and less carbohydrate – are continuing to sell well with people born in the 1980s and ’90s, known as millennials. “These diets are trending heavily with people under 30 in urban areas. Increasingly you’ll see products aimed at these groups in mainstream retailers, such as cauliflower rice and spiralised vegetables that can be used in place of pasta,” said Conor Hyde of Bullseye Food Marketing. “With previous generations, we associate unhealthy behaviours like drinking pints and eating unhealthy takeaway food, but the younger people around today are quite different. Consumers aged over 35 are also striving to be healthier but their behaviour is a little different. In particular they are well behaved from Monday to Thursday, eating healthily and getting to the gym, but then blowing off steam at the weekends with takeaways and alcohol. “The feeling is that they’ve been good all week and have earned a blow-out at the weekend,” says Mr Hyde. According to Mr Hyde, non-GMO is a food production trend that is likely to be extremely important in Ireland in the near future. He says that already in the US, non-GMO foods have overtaken gluten-free foods in terms of sales in the last year. “Usually what we see in the States translates over here shortly afterwards, and we predict this will be a big trend. A few years ago, around a quarter of the Irish population were buying gluten-free products on a weekly basis, but that’s now dropped to below 18pc,” says Mr Hyde. “There’s scientifically no proof that genetically modified foods are bad for you, but in the perception of the consumer, that’s not the case. “However there is a problem in terms of taking advantage of a trend like this for farmers in that there is no certification body yet in Ireland. Interest in organic foods continues to grow but at a reduced pace compared to previous years. According to the international consumer statistics company Kantar Worldpanel, the total market for organic food in Ireland in 2018 grew by €3.5m compared to 2017. This was driven largely through consumers making 6.2pc more trips to the shops specifically to purchase organic items. 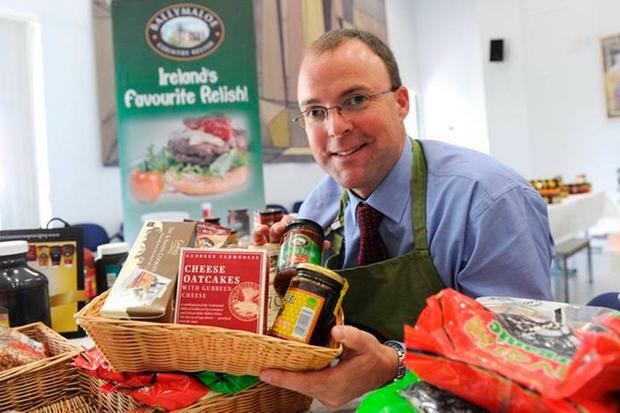 In 2018, 95.8pc of the Irish population bought organics foods, compared to 94.4pc the previous year. In the same period, the average price of organic food declined by 4.8pc. Bullseye’s Conor Hyde says that the reason growth in the market for organics has slowed is that such foods are now widely available, and to a degree are taken for granted. “Organic foods are more popular elsewhere in Europe but here they’re no longer ‘new’ so they don’t get as much attention. But it’s there and it’s growing,” he says. For Irish farmers this is potentially good news, as Irish-made food products are relatively low in terms of their water footprints. Mr Hyde suggests that this may become a good aspect of food provenance to advertise and differentiate Irish products in 2019.